BIBLE: GOSPEL LECTIONARY, "GOSPELS FOR THE HOLY RESURRECTION ACCORDING TO THE 8 MODES"
BIBLE: GOSPEL LECTIONARY, "GOSPELS BELONGING TO THE LITURGY, 8 PERICOPES ACCORDING TO THE MODES AND THE OCTAVE"
Description	 MS palimpsests on vellum, Mt. Sinai, Egypt. Texts 1-5 (underlying text): comprising parts of 5 different MSS, all in Christian Palestinian-Aramaic, 6th c., 2+11+13+16+7 full ff. and 1/2 f. 14x19 cm - 31x20 cm, originally 32x23 cm - 35x24 cm, 2 columns (originally 19x14 - 25-20 cm), 11-25 lines, originally 22-25 lines in Christian Palestinian-Aramaic uncial, 3 decorated crosses (2 of these are used for the book label of The Schøyen Collection). Texts 6-10 (overlying text): in Georgian, dated 979, 70 ff. (incomplete), 20x15 cm, single column, (17x12 cm), 22-26 lines in Khutsuri book script (Georgian ecclesiastical minuscule), by Johannes Zosimos, rubricated. Binding	 Mt. Sinai, Egypt, 979, black leather and linen from mummy wrappings over stout palm wood board, chain stitches on 5 sewing stations, bound and signed by Johannes Zosimos. Hole in bottom outer corner for a chain, iron nail with a conical head for a leather strap. Upper cover complete, lower cover with original leather over 19th c. wood, rebacked, the cords fastened to the cover with small loops of thinner cord, headband coloured red, blue and yellow. Pastedown of other leaves of the MS (6th c). Another 1½ ff.= MS 36 are from MS no. 3 (text 3), and ½ f.=MS 37 is from MS no. 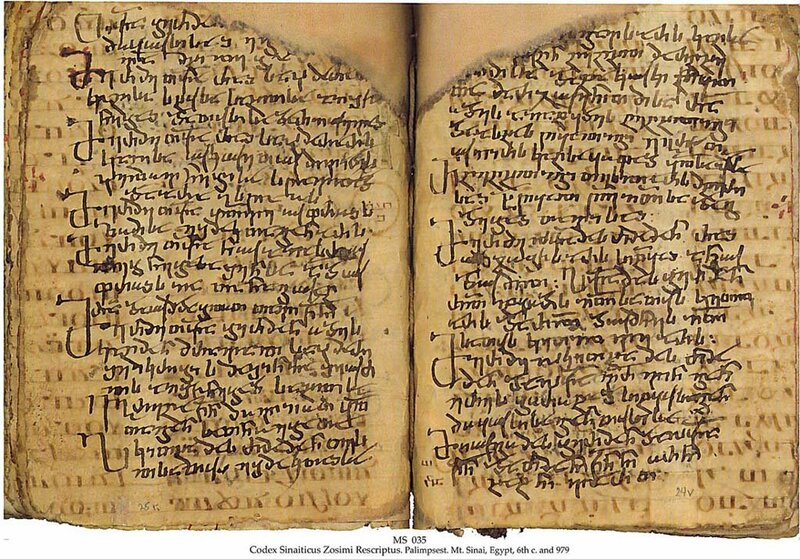 4 (text 4) of the original codices of 6th c.;16 ½ ff., also from the same codices, in St. Petersburg, The National Library of Russia (mostly St. Cyril: Catacheses), brought to St. Petersburg from Mt. Sinai in 1859 together with Codex Sinaiticus by Konstantin von Tischendorf. Further ½ + ¼ f from MS no. 3 (text 3) are in Göttingen: Niedersächsische Staats- und Universtätsbibliothek. Further MSS from Mt. Sinai see MSS 36, 37, 571-585, 613 and 2530. Provenance	 1. Monastery of St. Catherine, Mt. Sinai (6th-19th c.); 2. Friedrich Grote, Germany (ca. 1900); 3. Private collection, Berlin (1929); 4. D. MacLaren; 5. Sotheby's 12.4.1954:302; 6. Dr. Otto Fisher, Detroit; 7. H.P. Kraus, "Monumenta Codicum Manuscriptorum" cat. (1974):2; 8. H.P. Kraus cat. 165(1983):28, acquired Nov. 1987. Underlying texts: All 5 texts are the earliest extant in Christian Palestinian-Aramaic. Text 4: Addresses Delivered by St. Cyril in 348 AD to Candidates for Baptism. Text 5 is unique. Gospels of 6th c. in this rare language, closely related to the mother tongue of Christ, are of considerable textual interest. 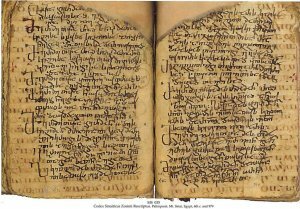 The script is together with the nearly identical one in "Codex Climachi Rescriptus", Mt. Sinai, mid 6th c., considered the finest and earliest specimen of Christian Palestinian-Aramaic uncial extant. Apart from the 3 MSS in The Schøyen Collection, only the Vatican, St. Petersburg and Mt. Sinai libraries have MSS in this language and script, and even the Mt. 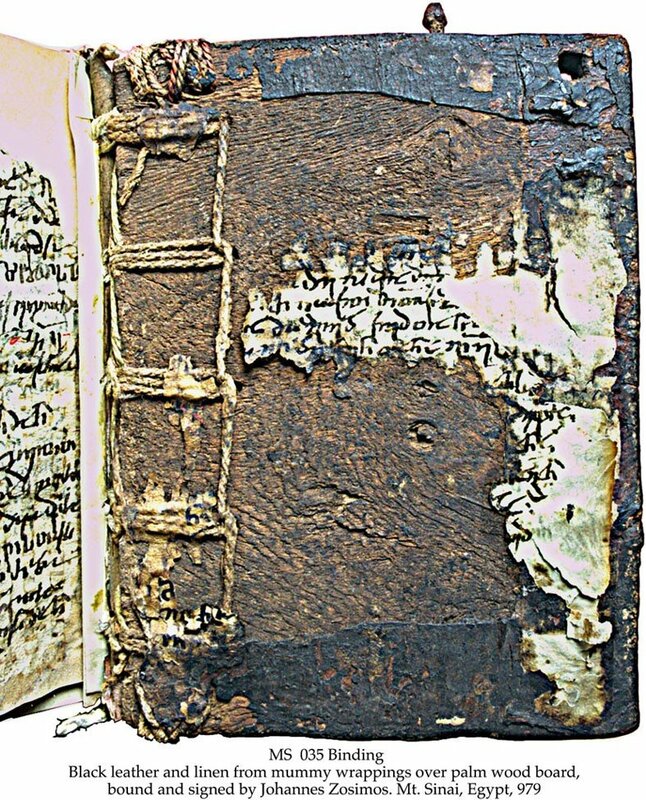 Sinai library has only 3, all from 11th c.
Overlying texts: Text 8 is unique, cf. MS 37. Text 9 is the oldest of the 3 extant. Text 10: This colophon extends over 3 pages, dated twice, Mt. Sinai 979. There are 20 MSS from Mt. Sinai in The Schøyen Collection. Besides the monastery's own famous library (4300 MSS), only British Library (8 MSS) and The National Library of Russia, St. Petersburg (69 MSS, mostly fragments), have comparable holdings. Published	 (underlying text): Alain Desreumaux: Codex sinaiticus Zosimi rescriptus; Description codicologique de feuillets araméens melkites des manuscrits Schøyen 35, 36 et 37. 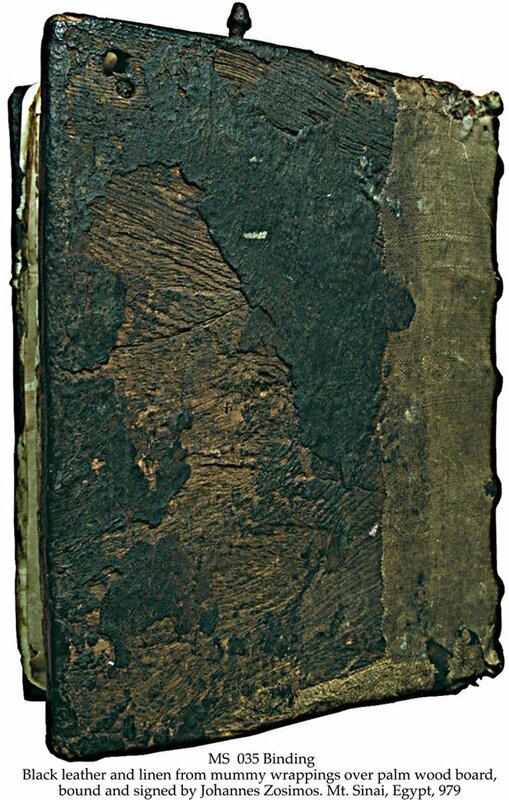 In: Histoire du Texte Biblique 3. Lausanne, Éditions du Zèbre, 1997. Land: Examinantur fragmenta syropalaestina; in: Anecdota Syriaca, IV, 1875. Orthodox Palestinian Society, ed. : Orthodox Palestinian Collection, vol. IV. St. Peterburg 1888, p. 233 no 81 (In Russian). Exhibited	 1. Conference of European National Librarians, Oslo. Sept. 1994; 2. XVI Congress of the International Organization for the study of the Old Testament. Library of Law Faculty, University of Oslo, 29 July - 7 August 1998.